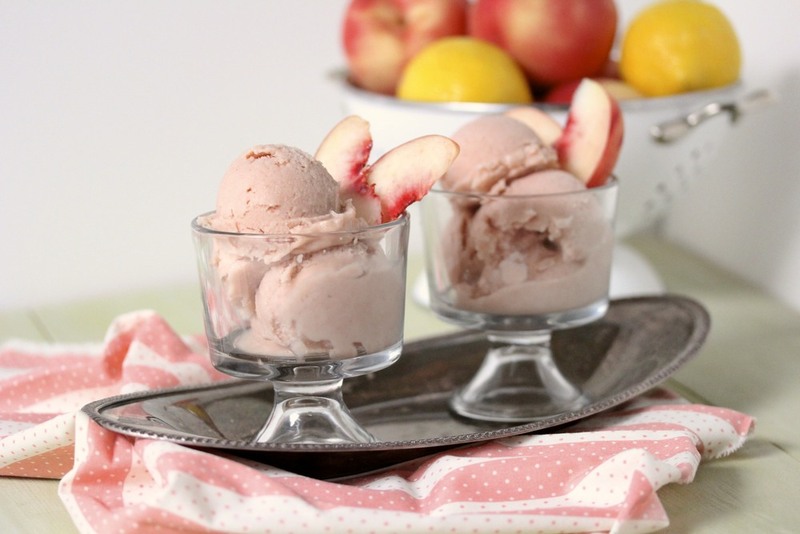 This creamy peach sorbet is the perfect summertime treat! I’d had my heart set on making a berry sorbet this weekend. But I have so many peaches laying around, as is my typical summer fashion, and really wanted to stretch beyond the slicing and gobbling up method. So in an effort to keep all you folks happy, I ran a mini poll on Facebook, with peach being a clear winner. Apparently you all love peaches just as much as I do! I don’t think a single person voted berry. I was curious and did a little peach research in preparation for this post. And if it’s not too geeky, I’d like to share a little nutrition info with you before going into the recipe. I learned that though the white peach seems sweeter, it actually contains nearly the same amount of fruit sugars as it’s neighbor the yellow peach. The reason that many would guess that the white peach is sweeter (myself included) is due to the drastically higher levels of acid found in the yellow peach. Given the lower acid content, a white peach often tastes more “floral,” while the yellow peach will have more of a peachy “kick” that many people associate with a traditional peach flavor. A study done by UC Davis in 2002 found that the vitamin C (one of the peaches main nutrients) levels in both varieties are nearly the same. But the phenols (a type of antioxidant) are frequently twice as high in the white peach! Naturally, this only served to further bolster my love of white peaches. Of course, you are welcome to make this recipe with yellow peaches instead of white. I will try very, very hard not to judge your personal peach preference. Even if you are foregoing all those extra phenols. 🙂 Though, if you do use yellow, you may want to cut back on the lemon zest/juice, as the peaches themselves will lend a nice amount of tart acidity to the sorbet. As I’ve touched on before, the addition of the coconut milk and alcohol is mostly to keep the sorbet from setting up to hard and icy when kept in your freezer. I generally use vodka because it doesn’t add any flavor, though a sweet white wine or rosé would be great in this recipe. Sorbets often turn very icy because the naturally-occurring high water content of the fruit lends for some pretty strong H20 bonds when frozen. Both fat and alcohol do not freeze (an exception to this is butter, which is about 18% water) and will break up many of those H20 bonds, lending to a softer sorbet texture. If you wanna keep it simple, leave these ingredients out. But the sorbet will most definitely taste best after processing in your ice cream maker and will be much less palatable after being in your freezer. You also have the option to add more coconut milk for a creamier sorbet, which would only help it to be even less icy when frozen (closer to an ice cream in texture). And if you ask me, the more coconut milk at a frozen treat party, the better. In a high-powered blender, combine all ingredients and blend on high for 1-2 minutes, or until mixture is fully emulsified. Pour into a bowl and refrigerate until cold, about 2 hours. (If you’re impatient, you can put it in the freezer for 30 min, stirring halfway through. Don’t let it freeze!). Pour the chilled peach mixture into the bowl of your ice cream maker and process according to the instructions. I have the Cuisinart Ice-21 and it only took 8-10 minutes for the sorbet to be ready. Best enjoyed immediately but will keep in the freezer for about a week. Note: If you like your sorbet on the sweeter side, add 1/4 c. date paste or raw honey. Additionally, if you don’t want the added calories from the coconut milk and alcohol, you can use gelatin instead to keep your sorbet from being too icy. Simply warm 1/4 c. of the blended peach mixture with 1 t. grass-fed gelatin to fully dissolve gelatin. Once dissolved, add back into the mixture and blend to combine. Gosh!! This is beautiful and creamy and I love it!! I have not had one single white peach this year– what is wrong with me?! They are my favorite. I’m inspired. Seeking white peaches in the morning!! Haha, shame on you for not eating more white peaches. Sounds like you should remedy that!